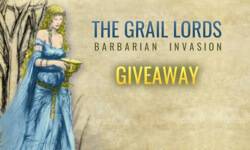 The Grail Lords is a free text-based browser game with medieval setting. 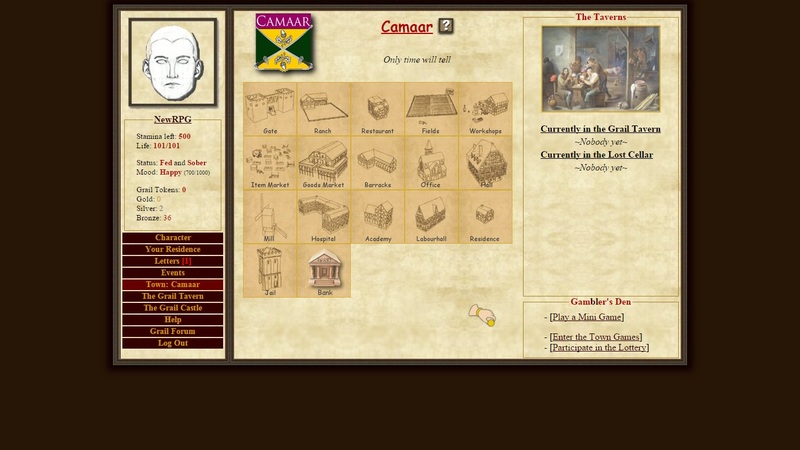 Your character profile lets you to be aware of basic information like score, tokens, popularity, honour, level etc. Your residence is a room where you can eat/drink, look for clothes in the wardrobe or peek in the chest to find tools and items. Visit restaurant, go to blacksmith, purchase various items, take courses in the Academy or try to get a job. The Great Hall is the center of the city where you can pay taxes or make a donation. 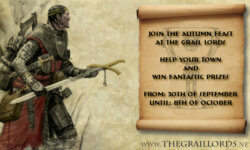 Visit The Grail Lords website! Neat little game. Slow but fun to progress. Just have to remember it, like watering a plant. Ha, I love the plant-watering analogy. It’s spot on. New to the game, but for the moment I really like the complexity of it. Yes, the graphics look outdated, but at the same time the art in each image creates a atmosphere. As a new player I’ve been welcomed by many other players who tried to help me. If you are looking for a very slow paced game centered on the players’ community, give this game a try and try at least to stick to it a few days. The tutorial is king of long, but it shows every aspect of the game. A game with a large amount of content. It’s based on a daily stamina reset so little time out of the day is needed. 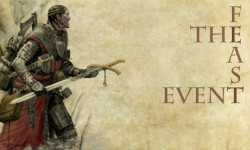 It has a nice community to keep people like me around so feel free to stop by the tavern and ask questions. A quickly fulfilling RPG. Spend as little time as you want it’s really fun. The game looks OK at first, until you spot the gaping security holes. The login and registration pages are served over HTTP, not HTTPS. This means that anyone who intercepts your requests going between the site and your browser can read your password. The site emails your own password to you upon registration – this most likely means that they are storing passwords in plain text, which means that if anyone gains access to the database they are stored in, they will immediately have access to the passwords of everyone registered. In the modern day, there is no excuse not to use HTTPS for situations like this, and there is DEFINITELY no excuse for storing passwords in plain text. Thank you for your feedback and reaction. We would like to add a few side notes on your reply. – The passwords of the Seekers are encrypted and not stored in plain text like you wrongly assume. – The Grail Lords both use HTTP as HTTPS. You can perfectly finish your registration using the HTTPS instead of HTTP. We will take measures that people using HTTP will now be redirected to the HTTPS version. Fun, detailed game. Play now before everyone starts to playing this awesome game! Do not be misleaded by the old fashioned look or the high learn-curve at the start. This game combines old-school browser game elements with a depth similar to the ones you can find in games as unreal world or rimworld. But unlike those games, you here can trade, talk and interact with other people. The community is small, but very friendly for no other reason then the interest they share in the game. If you like a challenge, or want something new, then I highly advise this game. A very fun and addictive game, which you can spend as much time on as you please. It has a tonne of skills to choose from to make your experience unique. I’d absolutely recommend giving this game a shot! Exactly what I was looking for in a text-based RPG/adventure. It’s fun, it’s free, and the time commitment is low – I’d say less than half an hour a day. I love the diversity of the in-game economy and professions too. You can fight monsters, go mining with your pickaxe, raise cows and pigs, heal fellow citizens in the hospital, and much more. The choices are yours, and so is the fun! Fun daily game. Free. Interesting, but not a massive time commitment. Great game easy to pick up with little commitments for time. The developer is a great guy and can be found in the chat often and responds to questions quickly and always listens to new ideas he could incorporate. I’ve been playing for over 5 years and still love this game. Also friendly people in the tavern ! I love this game and have played it daily since September. I used to play and host a lot of BBS games and this captures a lot of the flavor and feel of some of the old games while also incorporating modern game play elements and mechanics. Easy to get started and really no wrong way to play. It works pretty well on my iPhone as well. You can do everything you need to in a few minutes a day but once the hooks kick in you will want to check it more often. Cool game with a huge amount of content. Not everything is finished but is the dev actively adds depth and completes chapters. The best thing is its not P2W. There is a premium currency but its accessible to free users in a number of ways including buying them with in-game no restrictions. And the premium content has been nerfed over time to prevent abuse. Addicted to this game! Great community! Very helpful. Great game. Limited commitment per day– Complex yet easy to learn systems. Good community.